In Quechua, the word Pachakutiq means "He who overturns space and time." The word "Yupanki" means "with honour." It's from these words that the Inca ruler Pachacuti Inca Yupanqui derived his name. The man under whom the small Kingdom of Cusco transformed into the mighty Inca Empire, Pachacuti was also known as "The Earth Shaker." According to legend, during a battle with the Chanka (bloodthirsty enemies of the Inca) Pachacuti fought so well that the very stones rose up to fight at his side. Words are powerful things. They can make a man mighty, or a place magical. It's thought that Machu Picchu, the most famous Inca icon in the world, was built for Pachacuti. We're not entirely sure why, but popular hypotheses have it as either a personal estate for Pachacuti, or as a religious training ground for members of the Inca ruling class. Machu Picchu was constructed around 1450, when the Inca Empire was at its height. Just one hundred years later, the citadel was abandoned, probably due to smallpox. The Conquistadors never found the Machu Picchu; it sat silently amid the clouds while the Inca Empire below was mapped and slaughtered. For a long time, the city was lost in mist, left to ghosts and the growing jungle. I went to Machu Picchu with two friends. We took the easy way. Well, easy is a relative. The easiest way to Machu Picchu is the train. Tourists can take the train from either Poroy station near Cusco, or from the town of Ollantaytambo in the Sacred Valley. But at around $130, a train trip is pricey, and you don't get to do much walking on the way. There's also trekking of course, but the famous Inca Trail books up months in advance. Other treks are available in Cusco, though prices vary from operator to operator--if you have this in mind, be sure to ask around. You'll need 3-5 days. Walking the whole way takes a while. We chose the middle option: hiking alongside the train tracks from Hydroelectica, a small settlement ten kilometres from Machu Picchu. This option means taking a bus from Cusco to Hydroelectrica, then following train tracks through the jungle until you hit Aguas Calientes, a tourist town built at the base of the mountain leading to Machu Picchu. After a pricey night in Aguas Calientes, it's an early morning stagger up to Machu Picchu. There are 1500 unforgivingly steep stone steps to beat before reaching the top. The stairway opens to tourists at 5am, but it's best to be there an hour earlier. A lot of people make this climb, and you don't want to be at the back of the queue. The clamber upward is a determined scramble of panting travellers with flashlights and headlamps, trying not to trip in the dark. The sun comes up as you climb. At the top, Machu Picchu is a populated by tour groups and flag-waving guides. The view is magical; clouds slink across vast mountaintops, while sparrows flit between the stone walls of the dead city. You're not allowed to take food in, or anything out. In recent years, Machu Picchu has been seriously eroded by tourists stealing stones away as souvenirs. Keeping the site accessible but authentic has been a longstanding issue for the Peruvian government. In the 1980s, a large rock was removed from the citadel's main plaza to allow helicopter landings; in the 1990s, helicopter landings were banned for fear of causing damage. Meanwhile, UNESCO has been criticised for allowing tourists to access the location at all. There are serious risks of landslides and hiking accidents, as well as damaging all that history. 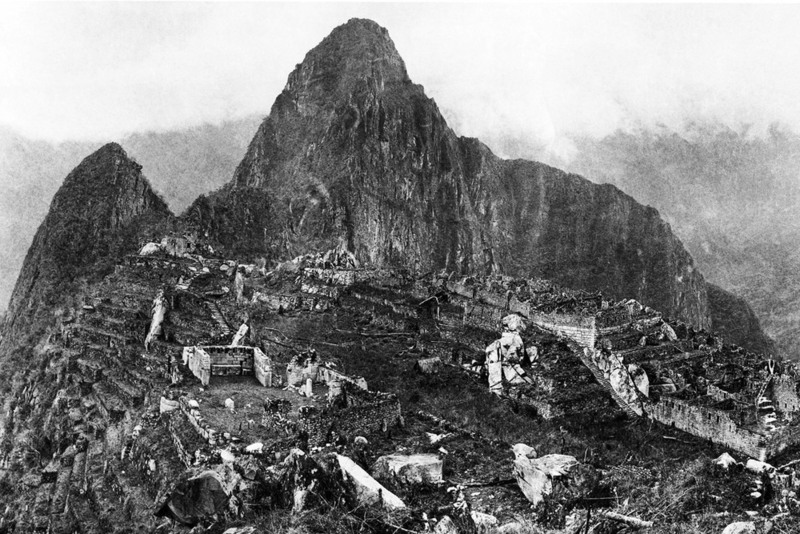 Hiram Bingham III, discoverer of Machu Picchu, and the original ruins prior to modern reconstruction work in 1912. Machu Picchu isn't really what it was called. 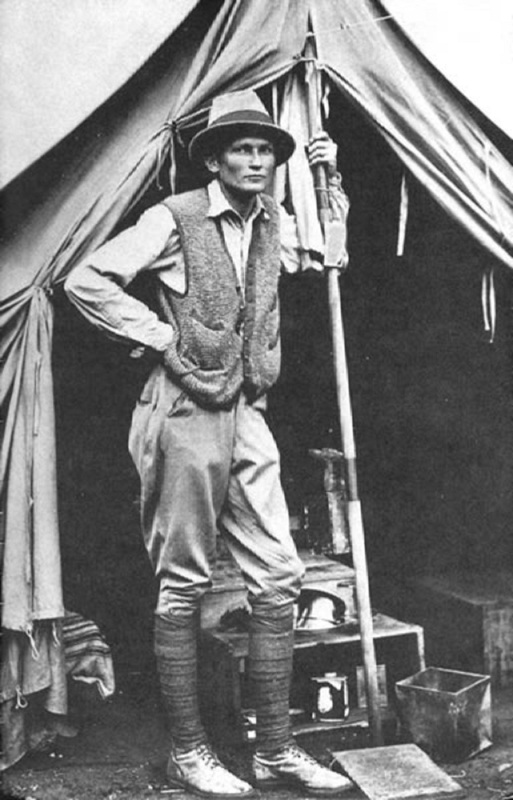 In 1911, American explorer Hiram Bingham III went in search of Vilcabamba, the last Inca city to fall to the Spanish. While in Hiram was travelling Urubamba Valley, a local farmer pointed him to a set of mysterious ruins on a mountaintop. The farmer called the mountain "Machu Picchu," meaning "Old Peak." Hiram brought Machu Picchu worldwide attention (though some evidence indicates the city may have been found and pillaged by a German named Augusto Berns about 44 years earlier). Since then, it's been Peru's most famous landmark, and a must-see hub for travellers visiting the country. In 2012, Spanish historian Mari Rubio claimed to have discovered the real name of the ancient Inca citadel--"Patallaqta," meaning "Step City," in Quechua. Many of Machu Picchu's tour guides nevertheless still claim that the true name of the city remains unknown, shrouded in mystery. In truth, it doesn't make much difference. Its the words that people know which stick. The mountain city of the Incas was called something else, but it was swallowed up by mist and time and jungle. Nowadays, Machu Picchu is the name on all the maps. It's the place that people come to visit.